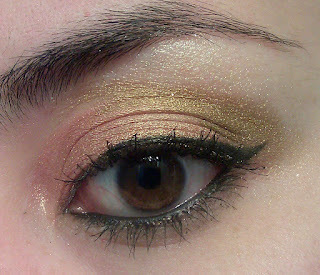 Here is a quick face of the day using a few of my favorite pigments. I started with NYX eye shadow base in white all over the lid. I then applied Mattese Elite Star Dust powder in Glitzy, a shimmery copper that looks good on everyone. It's definitively a product I reach for if I only have 5 minutes to spare. I didn't foil it this time, but trust me it looks AMAZING wet. It takes on a metallic quality, like wearing molten copper on your eyelids. In the crease I went with a new favorite, Magnolia Makeup in Gilded. I was lucky enough to come across their booth at The Makeup Show, and chatted with lovely ladies from Magnolia. If you love gold, especially old golds, you NEED to pick this up. Gilded is a old gold color with micro glitter that is heavily pigmented. I get the feeling I'm going to use this color a lot! Then I used Baja Sand from LA Splash on my browbone. I lined my eyes with Cailyn gel liner in black (aka my Holy Grail liner), added a cat eye for good luck and was done once I threw on some Benefit mascara. 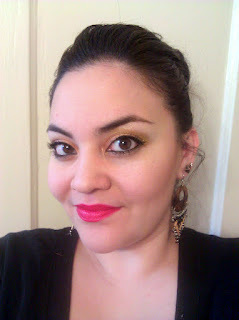 I'm currently going through a love affair with OCC Lip Tars, one that is not ending anytime soon! Today I used Stalker, a blue-based red that makes your teeth look awesome! Since I wanted the red lips to be the main focus, I only used some translucent powder and a little bronzer on my cheeks. Sorry for the quality of the photos, I took these using my phone. I wanted to be able to post more often, so using my phone, especially the Blogger application helps! I've also been putting up face of the days over on Instagram under the name liquorlubeandlipstick. Check it out and let me know your Instagram handles. Also, if you like how Glitzy looks, you can actually pick it (and other colors) for 1/2 price off the Ricky's website. They retail for $13, so picking them up for $6.50 is a great deal. I would also recommend Kaleidoscope (MAC Club dupe), Navy and Undress, as well as Glitzy. Thats beautiful dear.. loved it !!! this look is so cute I love the eye colors. Thanks, hope you are doing well!